Hair Transplantation, the only permanent and effective methods of hair restoration, puts forward the best solution for curing baldness. The ongoing research and fast advancements in Indian healthcare sector have tamed the hair care facilities in a perfect way, opening multiple to helps the patients. Hair transplantations Surgery is a highly sophisticated process, requiring practice and experience to master it. In such a scenario, Dr Y V Rao Clinic employees specialised surgeons to treat you the best, which are dedicated to provide excellent facilities of hair transplantation in Hyderabad (India). We help you avoid the risks of hair restoration, which may arrive on getting the treatments from daily-opening hair clinics in Hyderabad (India). Our high success rate, before-surgery consultations, and custom cutting-edge clinical methods are recognised in industry for assisting patients overcome serious baldness and hair fall issues. Known to provides efficient and quick results, our team can treat any type of hair troubles. Women have generalized hair loss, thinning and poor growth, all over the scalp. Unlike men, women do not have defined sensitive and non sensitive hair roots which can be selected for transplant. Hair becomes weak all over the scalp. The weak hair has higher chances of shock loss. Women also respond better to the medical regrowth of hair. 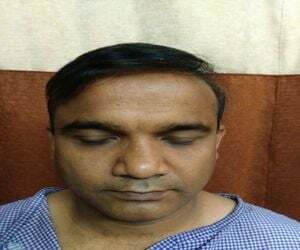 One should not advise hair transplant in women unless they have tried 2-4 month of vitamins and lasers. Then if required, plan a limited hair transplant for selective areas of maximum concern. The naturally-occurring occipital hairs (on the back side of scalp) are carefully transplanted on the recipient site using a well-defined procedures. The process is carried out under locals anaesthesia, causing no pain to the patient. It takes some two-three months for the natural hairs to grows again. It is mostly used to treats individual pattern baldness. From this minimally invasive procedures, grafts containing curly hair follicles that are genetically resistant to balding, (such your back of the head) are transplanted to the bald scalp. Hair transplant at Dr Y V Rao Clinic is carried out under locals anaesthetic. Locals anaesthetic agent is injected into the donor area of the scalp (the anaesthetic will sting a little but is quite bearable and goes numb very quickly) and then this desired quantity of hairs are takens one by one from it. They are carefully harvested in a divided pattern to minimize the visual decreasing of occurrence in the donor area. Then, the balding area is also anaesthetised and lots of micro-incisions are made by using a specially formed micro-needle. The grafts are then put into these incisions. After the anaesthetic agent wears off at three to four hours the scalp will feel somewhat tight and sore but this soon eases and returns to normal in a few hours. Simple paracetamol or co-codamol will help. Nominal swellings may also be observed, and is completely normal. The operated areas of the scalp will appears somewhat pinkers than normal for a few days but this soon passes. The tiny hair that is transplanted normally falls away in a couples of weeks. This is normal and due to "thermal shock". The hair will then grow normally from the hair root increases in noticeable by approximately 3-4 months and carry on growing as fast and as long as your normal hair. If the Doctor is transplantings into a thinning area, then this can occasionally cause momentary shedding of some existing local hair shafts. They will then re-grow. Avoid junk and spicy foods. Have more fruits, vegetables, dry fruits like (Almonds, Raisins, Dates-3 to 4 /day for your life time). Have protein rich foods: veg-Dahl, Soya, legumes (beans), groundnuts (boiled)... non veg- eggs (2 /day),fish (2-3 times/ week). You can sleep on back or sides. Do not sleep in prone positions (sleeping on tummy / head facing bed) for one week. Take shower everyday with Betadin scrub shampoo given by us for one week, followed by any routine shampoos. During the first week, please allow the lather of the shampoo to stay on the scalp for 3-5 mins and massage with moderate pressures in a circular manner to remove any blood clots/scabs that form. If necessary, continues this later also-idea- TO KEEP SCALP CLEAN. Do not bend your head forwards too much. You may notice swelling of face 2-3 days after operation, which may increases on bending the head forwards. Hence try to be in relaxed chair positions keeping head backwards. Keep ice pack on entires scalp after the first wash -on the back of head (from where hairs were taken or where sutures were placed) and top of Head areas (where grafts were kept). It relieves the pain and swelling significantly. keep icepack for 1 min at each place. Total-10-15 mins/ session and repeated 3 times /day for 3 days. You may develops excessive pain in the night after operation or later. please do takes extra pain killers which is mentioned separately, after a few biscuits or other food. You may experience heaviness and numbness of head and feelings of whether the head is resting or not on the chair or pillow in bed for 2-3 days. You may also experience tightness in the first week after operation, especially after strip procedures. this tightness may persist for 2-4 weeks after operation. but with each passing day, you will notice improvements. Hair Medicines for 1 yr.(min), -can be continued later also for better results please take them in evening after food. Our hair transplantation experts are renowned and specialized. We are the best hair treatments medical center in Hyderabad. Affordable pricing and best result is our guarantee. Our high-profile and celebrity patients trusts us the most. To consult and receive best quality hair transplantations services, either visit or call us today.